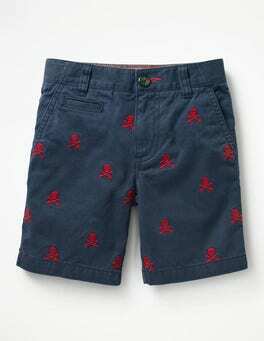 Stay smart enough for family outings, even on the hottest days, thanks to these chino shorts. This soft twill design is garment dyed for an individual, authentic finish. Oh, and for an extra bit of Britishness, we've decorated the belt loop at the back in red, white and blue. 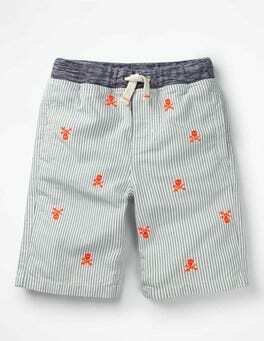 With fun prints and a cool knee-length style, our shorts are great for warm-day adventures. They're made from hard-wearing 100% cotton, so they can handle everything from tree-climbing to hitting the waves. They're easy to pull on too, which makes for quick dressing when fun times call. Bullseye! Super comfortable and easy to wear, our longer shorts in hardwearing striped cotton jersey are right on target this season. Ready to explore? Pop on our knee-length shorts. The four pockets fasten securely, so no matter how lively things get those treasures will stay safe and sound. The fabric is light and dries quickly – perfect for splashing in streams. 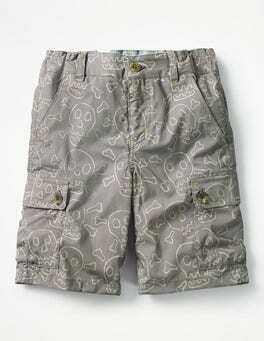 Keep cool in these classic cargo shorts, made for unforgettable sunny days. They’re crafted from breezy cotton linen, so you won't get too hot when you're running around the beach or park. An adjustable waist gives you a perfectly comfortable fit – even after the double helping of fish and chips.